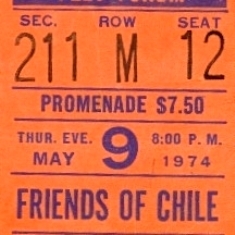 “In the Spring of 1974, the late singer and songwriter Phil Ochs organized a concert to benefit the Friends of Chile. Chile, of course, was a country in peril; one that badly needed friends after their democratically-elected President, Salvador Isabelino del Sagrado Corazón de Jesús Allende Gossens, was Suicided by the military (with an assist from our very good friends of the Central Intelligence Agency) in Santiago on September 11, 1973. As I say, Chile needed friends . . . and on May 9, 1974, this is what Ochs came up with. 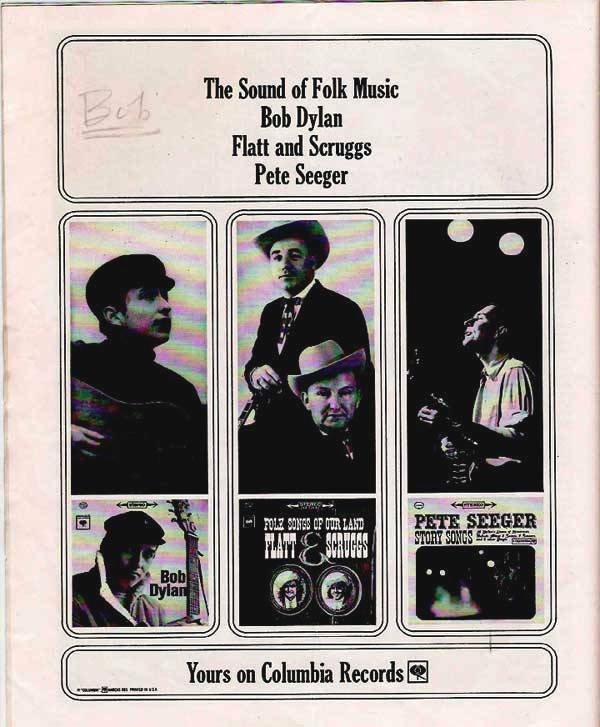 To call this line-up eclectic is hardly adequate, but what milder euphemism could there be for an evening at the Felt Forum in New York’s Madison Square Garden with the likes of Pete Seeger, Melanie, Arlo Guthrie, Mike Love, Dave Van Ronk, Dennis Hopper, Phil Ochs, Dennis Wilson and . . . oh, yeah . 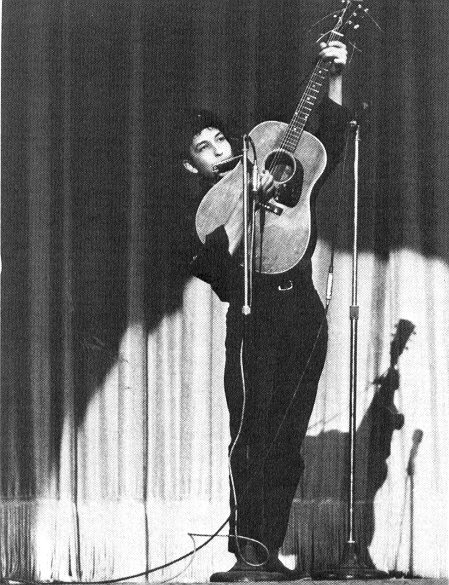 . . Bob Dylan. 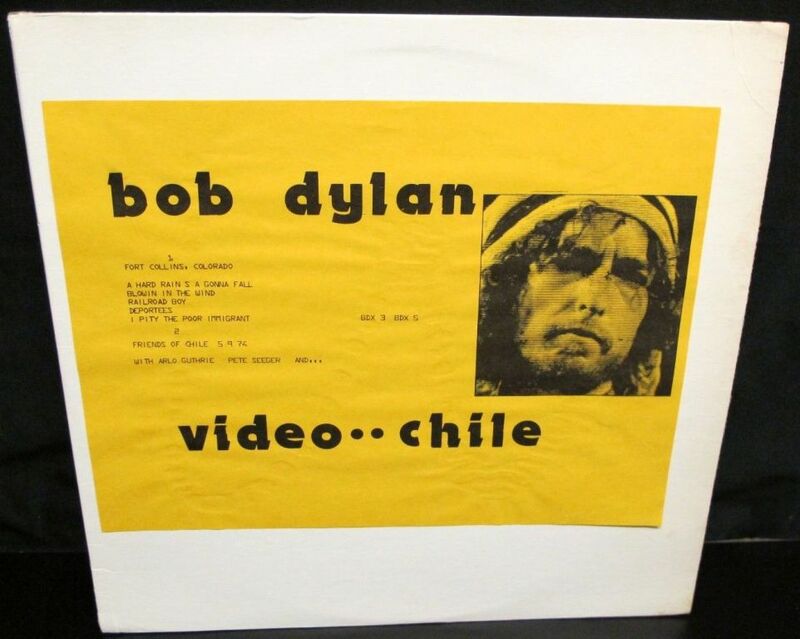 Dylan reportedly got roped into this gig after Ochs played upon his conscience in a weak moment (and who wouldn’t love to have been a fly on the wall for that one), and from the minute he hits the stage he makes no secret of his commitment to the cause of extricating Chile from the savage bonds of a far-Right dictatorship. 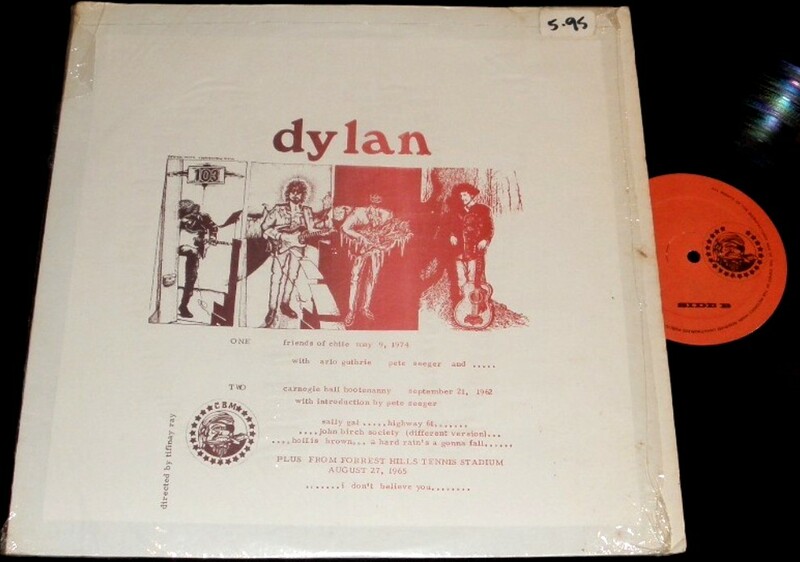 Tracks 1 – 4: Dylan’s first appearance on a concert stage as part of an all star Hootenanny organized by Sing Out magazine. 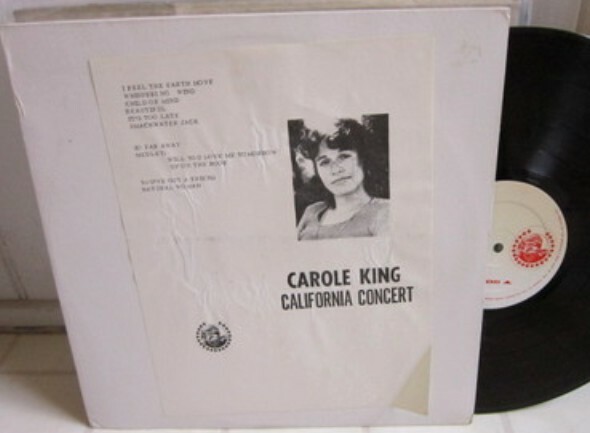 First time “A Hard Rain’s Gonna Fall” was performed and exactly one month before president Kennedy announced the discovery of Soviet missiles on Cuba on national TV. Quality: “Satisfactory mono” in HW, bobsboots rates the Forest Hills ’65 track as “barely listenable”. 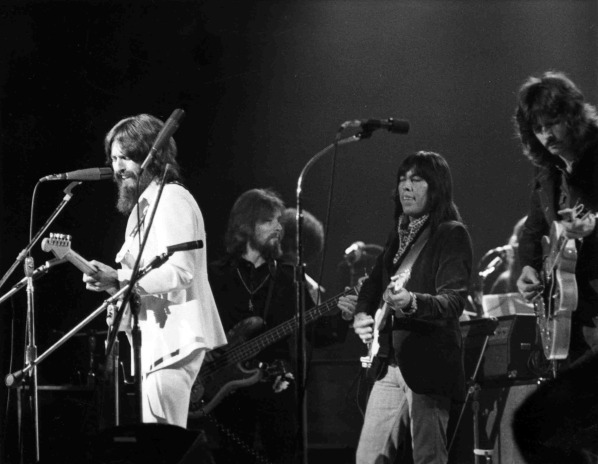 23 May 1976, Hughes Stadium, Fort Collins, CO – broadcast as an NBC TV special and five songs ended up on the officially released Hard Rain live album, released in September of ’76. You can read the background story of the concert here. 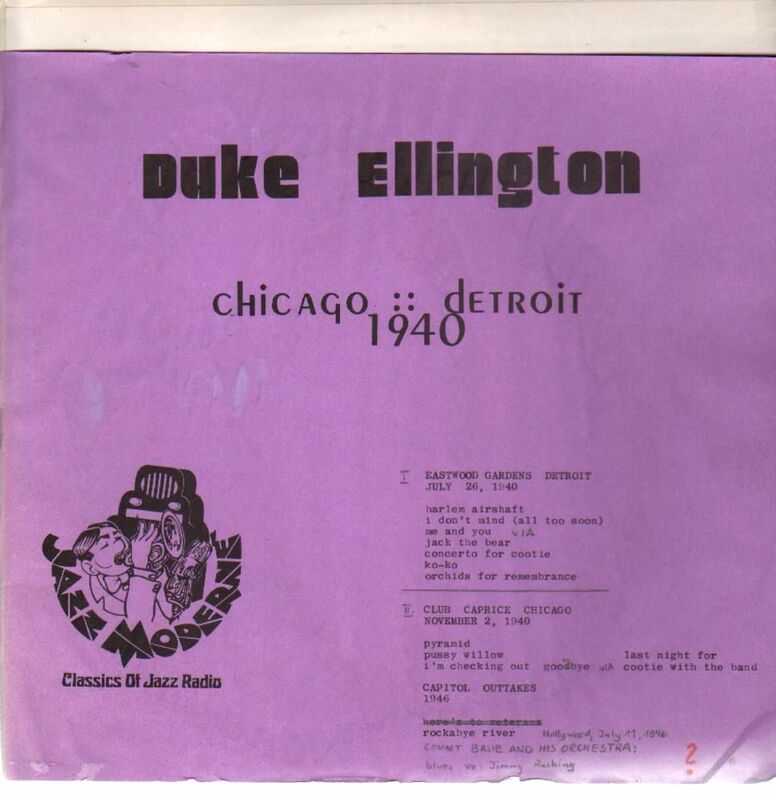 The inclusion of this material on video chile was a copy job using TAKRL’s last release (# 1999) Bridgetts’s Album. video chile is extremely rare and was perhaps one of the last CBM releases in 1977. Discovered by a frequent contributor and source of expertise without whom the blog would have a lot more inaccuracies and mistakes. A big public thanks for that. Now, we know where the 1974/5 J.Fish cartoon cover came from. If anyone knows of any further titles, do let me know. 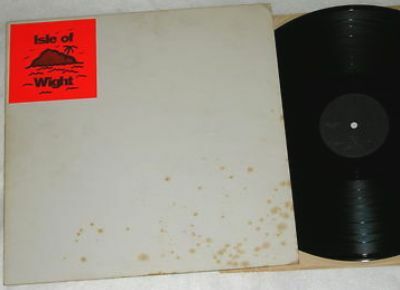 As Billboard wrote in 1974 that “jazz is the genre that seems to be bootlegged the most” but I will leave that field to someone else to research … or perhaps that’s already been done. 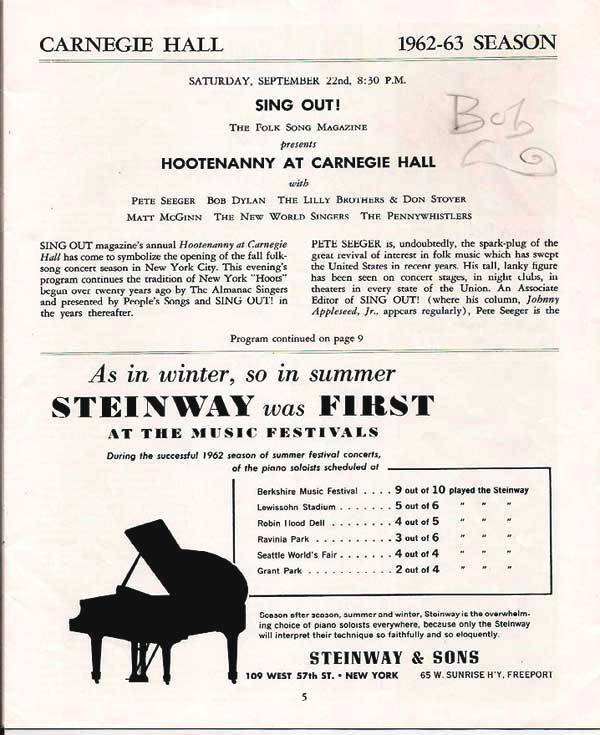 The best analytical notes of these three titles are still the ones written by bootleg needle dropper “doinker”: “The recording “October ’72” is supposedly from the Nassau Coliseum in 1972 [They did not play there in ’72, see tour schedule at the end]. 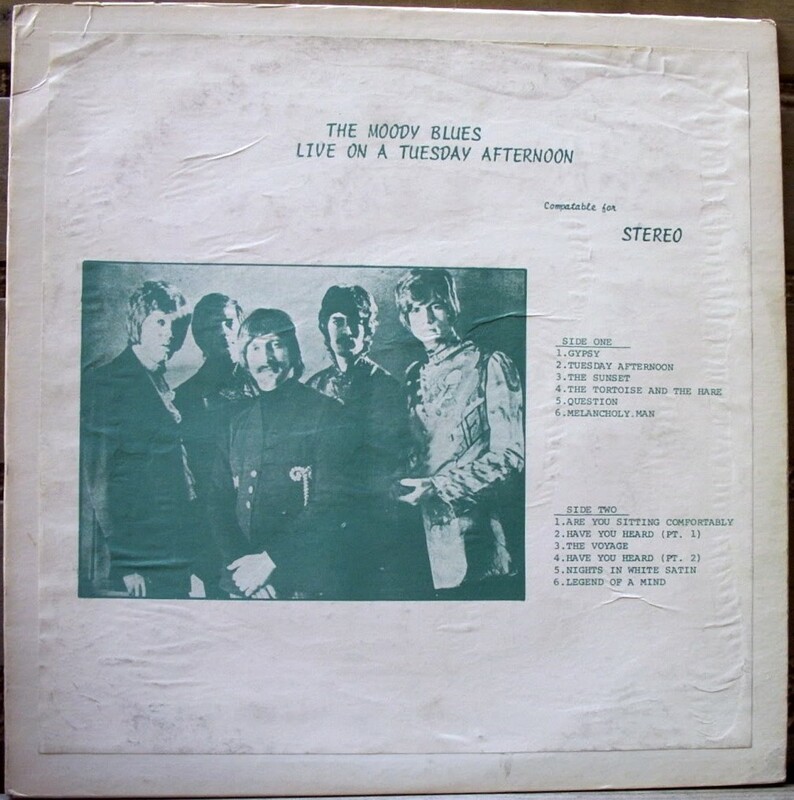 According to the Hot Wacks discography, the recording “Live On A Tuesday Afternoon” is the same show. Sorry guys, it isn’t. The recording is somewhat similar, the performances are not. 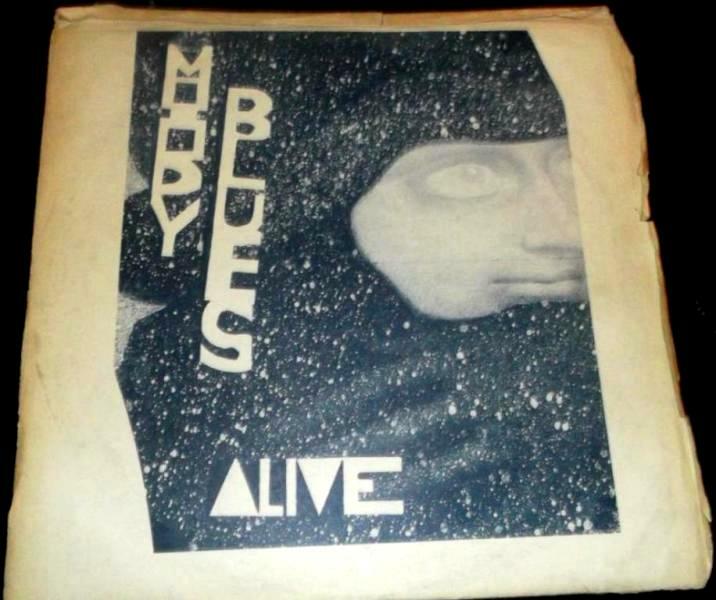 LOATA, along with its even rarer identical companion “Moody Blues Alive”, are perhaps the rarest of the Moodies live vinyl. LOATA was probably limited to under 200 copies, and only came out once, a very long time ago. 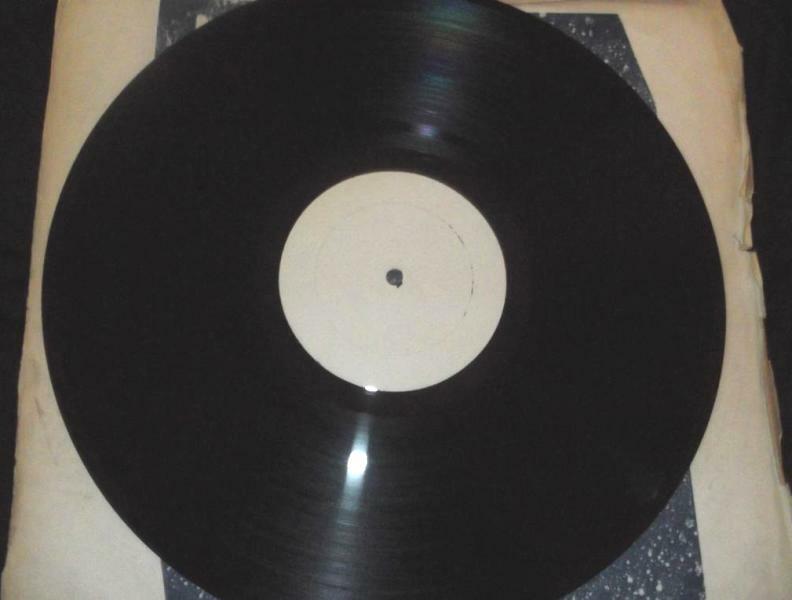 To those who understand the following lingo, it’s an East Coast WCF pressing, made in either North Carolina, or Flushing, NY. 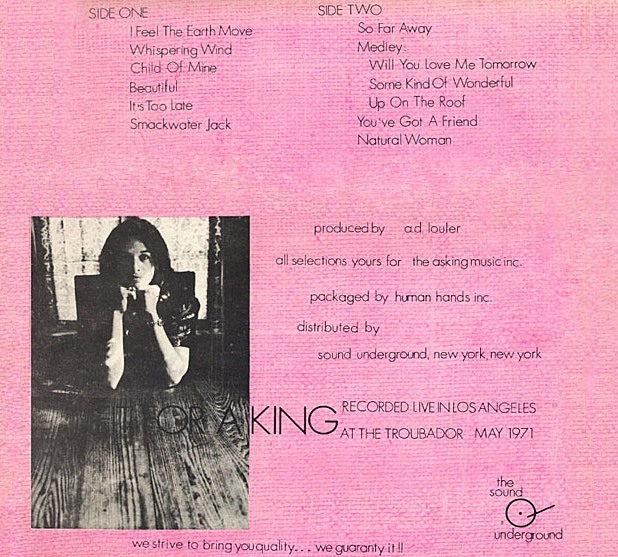 WCF’s typical cover and label design for their 1971/2 releases. 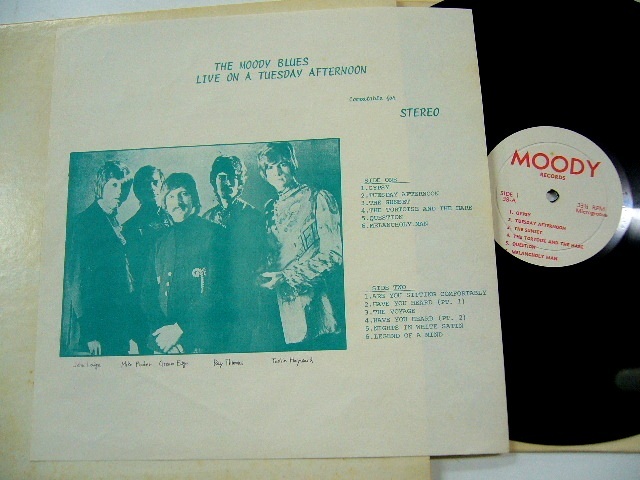 I have no information about “Moody Blues Alive”, except that the pressing may be European. The cover was a small insert with a stoned-out face floating in a blue starfield. Both pressings are quite good, but the production values were not. Some idiot added echo during the mastering process, and stopped and started the tape, producing a loud “thwack!” each time. It seems the tape was fast-forwarded and stopped to make the transfer as quick as possible. 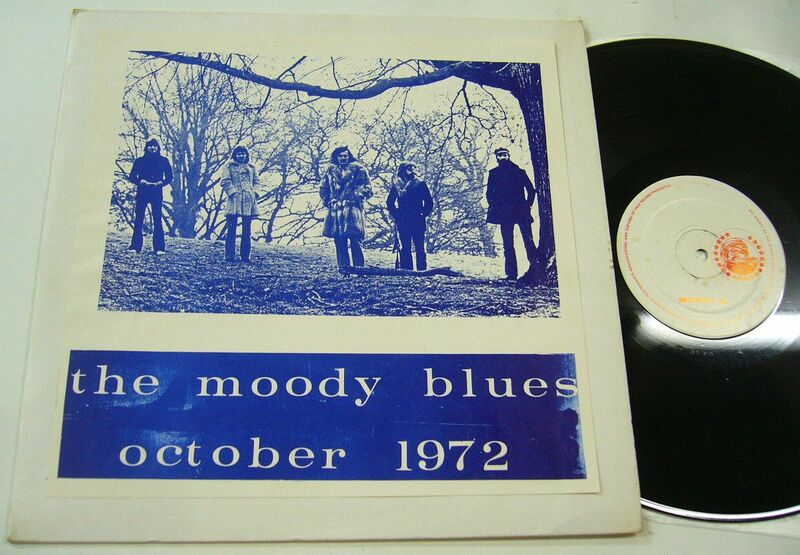 “October ’72” came out more than one time. 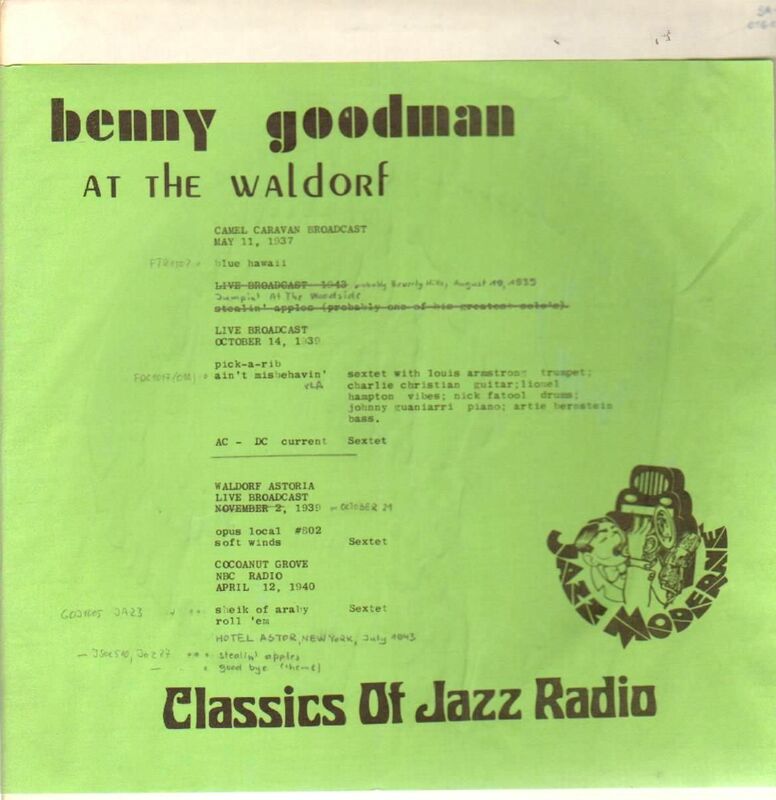 It’s probably best to call it a Berkely Records production (also East Coast, somewhat later than LOATA [I believe WCF/Berkeley Records was based in/near the state of Illinois]). 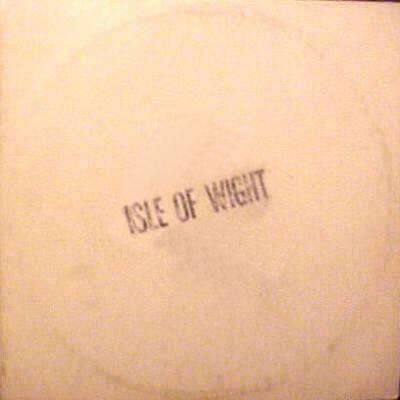 Most of the pressings were terrible, and this one is no exception. There are a few good pressings of this show by the way, but they all suffer from speed problems. The real treat here is the impromptu version of “Oh! Suzannah!”. It’s great, short as it is. This release went through many different issues released by different people in Europe and in the US. Most common are the TMoQ’s releases of this material (BD 521; 71050 & 1855). I will not document all of these variations, as they are already on bobsboots, I just want to mention the likely original issue. 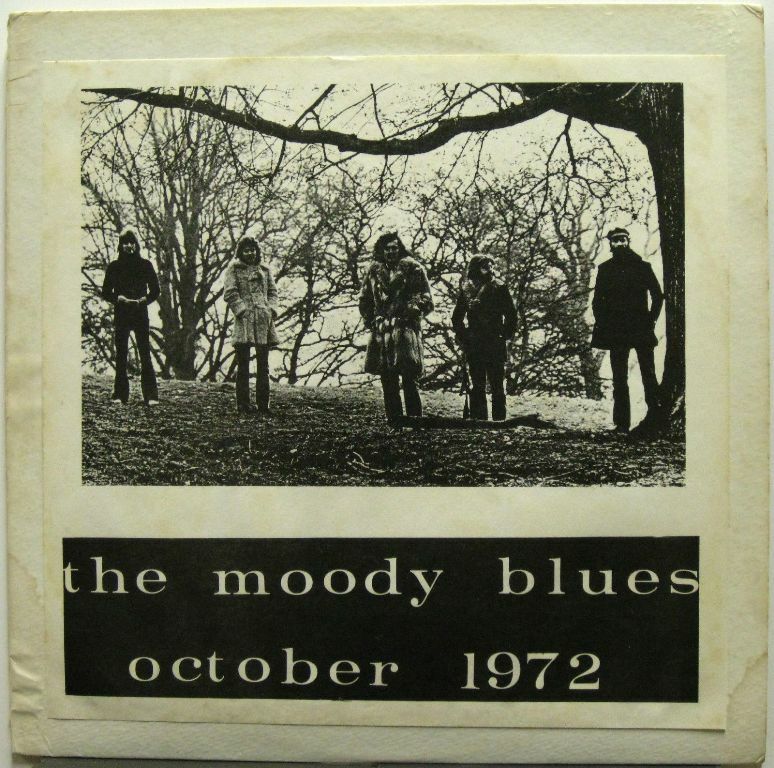 At the beginning, we find this 1970 British bootleg. 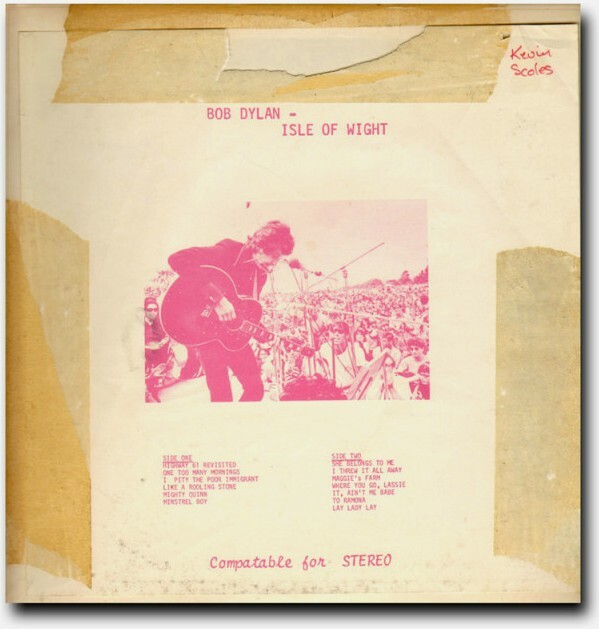 “As with most early bootlegs, it was released with several packages that varied slightly from one another. The first version has an extra flap on the front. It had a small blank black label and black vinyl. It was issued with and without the title stamp. Only eight Contraband titles were ever pressed on colored PVC: Hendrix, Clapton, Mayall & Bruce, Ticketron (Jethro Tull), British Blue Jam (John Lennon/The Rolling Stones), Seventy Dollar Robbery (Dylan), Young Man’s Fancy (Neil Young), Plynth (Rod Stewart & The Faces), Staesboro Blues (Allman Brothers) and this Cat Stevens release shown here. 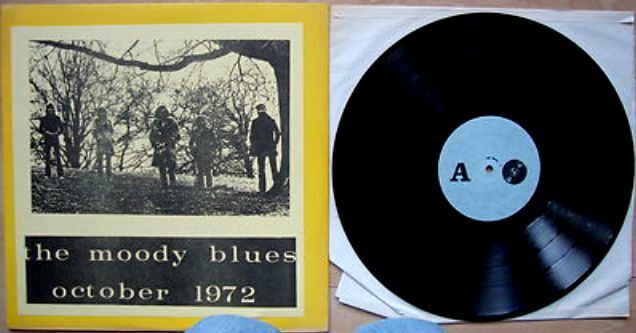 These were probably pressed around 1972 / 1973. 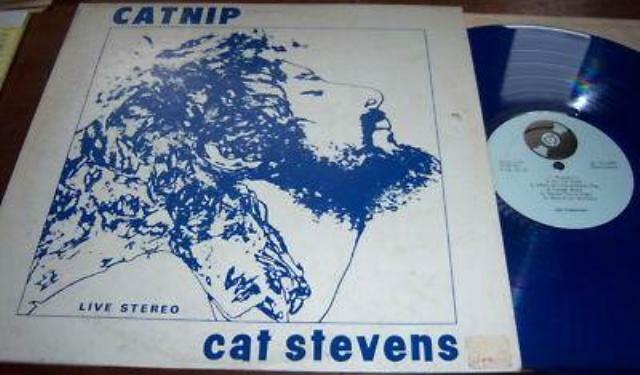 CATNIP exists in blue and much scarcer red and purple vinyl colors. 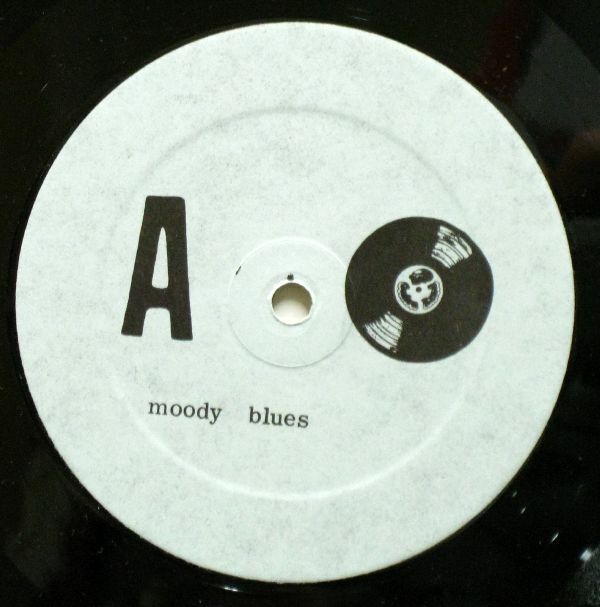 Quality rating: HW gave it a “Vgs”; one track is online and sounds “Exm” in my personal rating. HW says “Live in Boston”, the internet attributes this as “Chicago 1972”, with nothing on the recording to base the city claim on it. 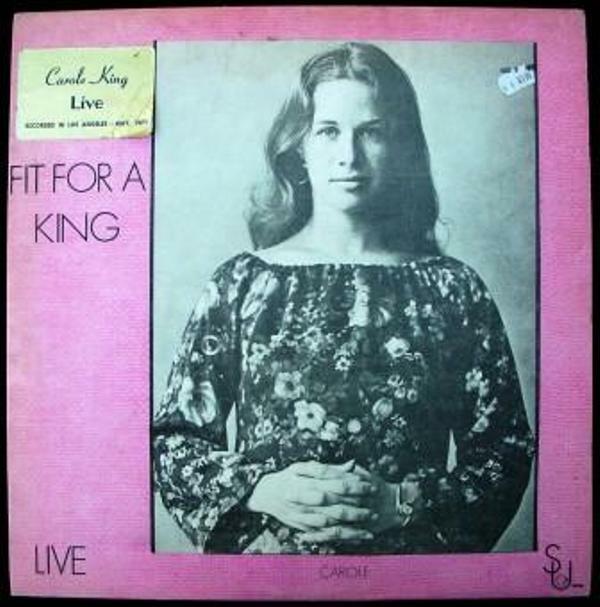 There are no songs on here from Catch Bull At Four, the album he released in September of 1972 (some of the 1972 shows include “Can’t Keep It In” and “Sweet Scarlet” or “Ruins”). 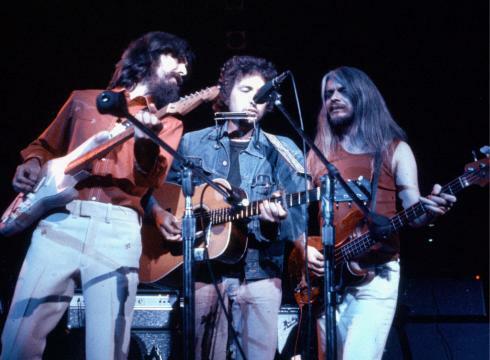 UPDATE: Now confirmed as having been taped at one of the two shows Cat gave at the Village Gaslight Cafe in Manhattan on either 30 November or 1st of December 1970. “I came by this tape by way of a trade with a Norwegian bootlegger a decade ago. Quality is standard audience recording, cheap machine secreted in greatcoat. In spite of this, a great moment in time recorded for posterity. 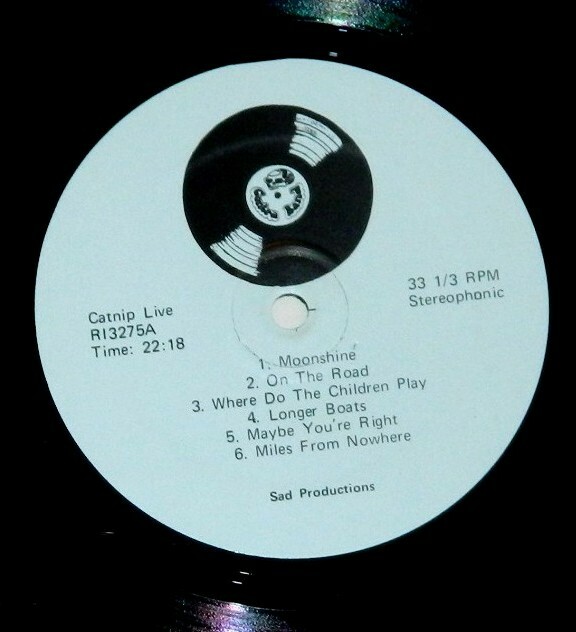 Whoever recorded it probably just wanted a souvenir of the show but it sounds as good as the vinyl boots around. 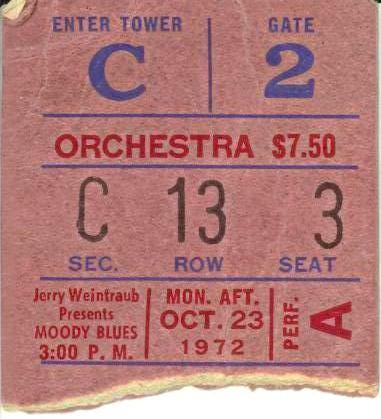 The gig was from Cat’s second U.S. tour. The Gaslight was full to its 300 or so capacity. Nice intimate atmosphere! The tape starts with some setting up of guitar mikes by the crew, you can imagine a few burly guys plugging leads in with plenty of bum cleavage showing! The audience are evident by their chatting, coughing and clinking glasses. The punters respectfully hush for a perfect opening rendition of Moonshadow. Falsetto ending, decent applause. Alun and Cat tune up and then into On The Road To Find Out. Powerfully sung over just the two guitars and Alun chipping in with vocals. A great sound and the crowd are appreciative. Cat introduces Where Do The Children Play by saying he wrote the song about two years ago and dedicated it to kids. Larry Steele provides electric bass on this one and Cat and Alun parry acoustically. The version doesn’t deviate greatly from the studio version although there’s no percussion. “Now my first hit over here” Cat purrs in an American accent to introduce Wild World to a few chuckles. The song is well received. Again they tune up and Cat calls for Alun’s bass to be turned down. “A song about spaceships, y’know what I mean?” Cat has difficulty getting his old star studded Gibson in tune and says “wouldn’t it be great if you could just press a button and it would be in tune…guitars are only human anyway.” Assuming it’s his Gibson as he says it’s old fashioned – The Everly Brothers used the same model. A lovely guitar intro to Longer Boats and then my tape chews up slightly, a flaw on the original tape. A shame as the best song so far in my opinion. Cat sounding confident and great choppy timing. The extra verse adds a new dimension to the vague lyrics of the song. Perfection! 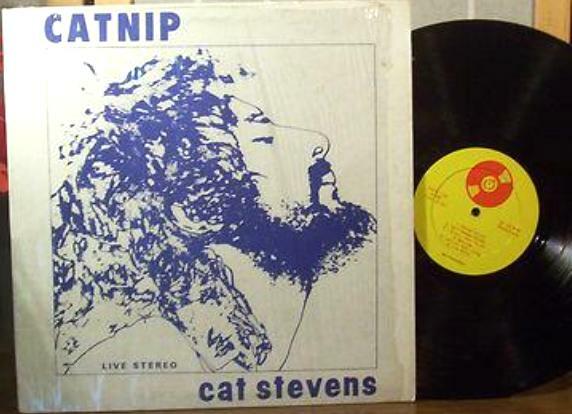 Maybe You’re Right – just Cat with Alun strumming, the piano and Cat’s voice carry the bluesy melody just right. The melancholy feel continues with Sad Lisa, sounding sparse without the violin. Miles From Nowhere completes the keyboards set, again very blues based and powerful. Cat introduces Hard Headed Woman, you can tell they’re all having a good time. Some tuning up then Peace Train chugs along with the audience clapping mostly in time. Cat and Alun harmonise exquisitely. Straight into Father And Son, again it’s close to the album version. Cat’s voice descants between the split personality of dad and headstrong son. Alun’s contribution on guitar and vocals is superb – his sweet voice complementing Steve’s harsher tones. There’s lots of audience chat as the trio take a breather. 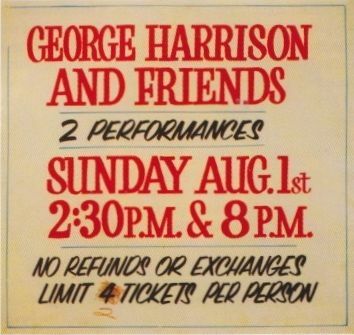 The only memento from his 1970 tour I was able to find is this L.A. newspaper ad. For other/earlier versions of this very popular bootleg click on this link. USA: East Coast, ca. 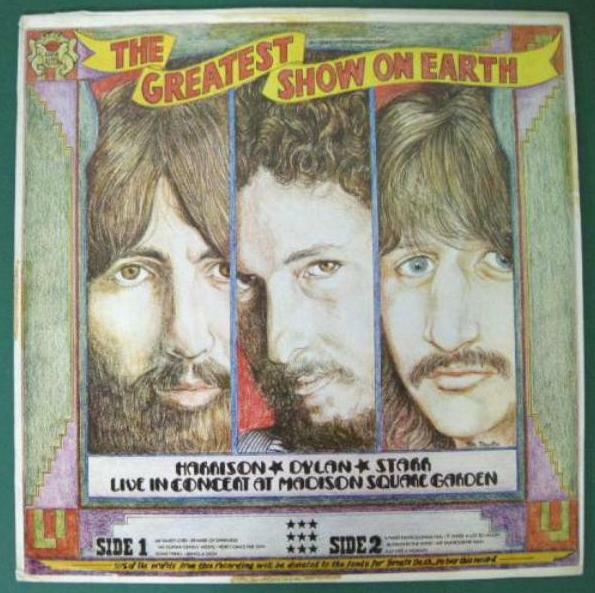 1972, identical master to The Greatest Show On Earth (Share Records GH 6699), I do not know which version came first. 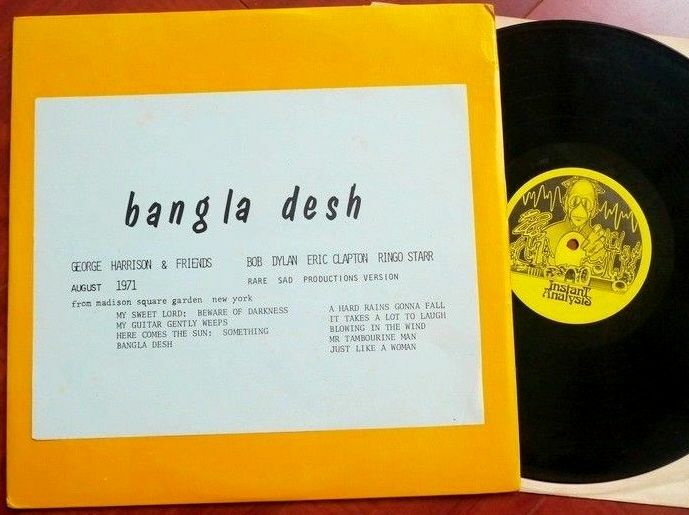 bobsboots.com: “This ‘version two’ Bangla Desh concert LP was issued in 1971 by FRT Records. 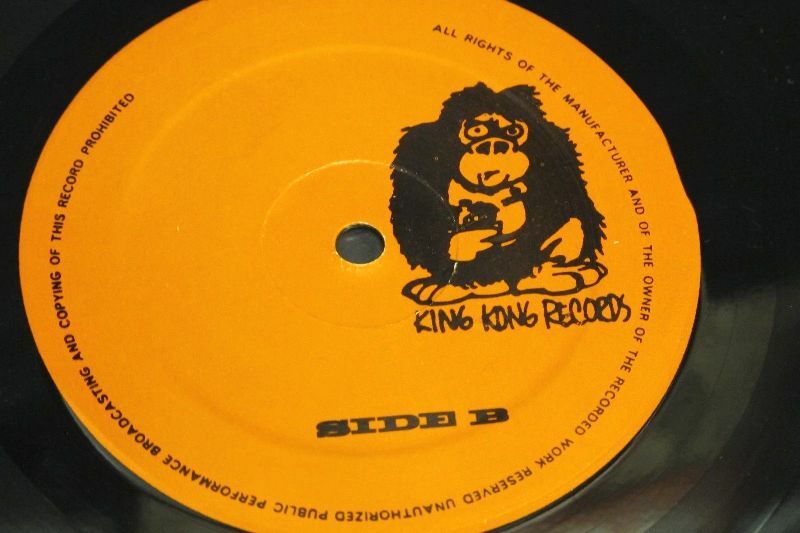 The plain white sleeve carried a black on white insert with small, unflattering cartoon drawings of the artists. Black vinyl. 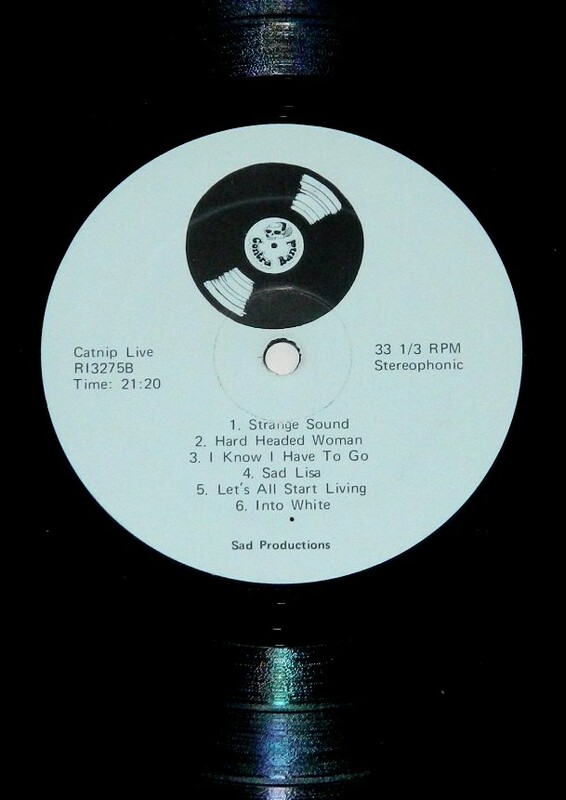 The labels are either blank blue (some were stamped “SIDE A”, “SIDE B” and/or “33 1/3 RPM”.) or are the generic GLC labels. 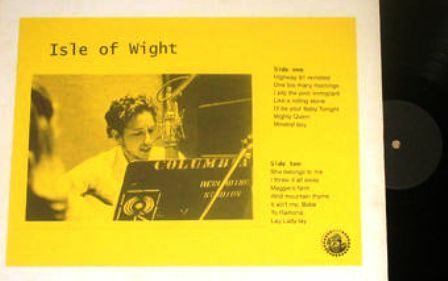 Hot Wacks claims that the FRT BRK 1001 album contains excerpts from the afternoon show. 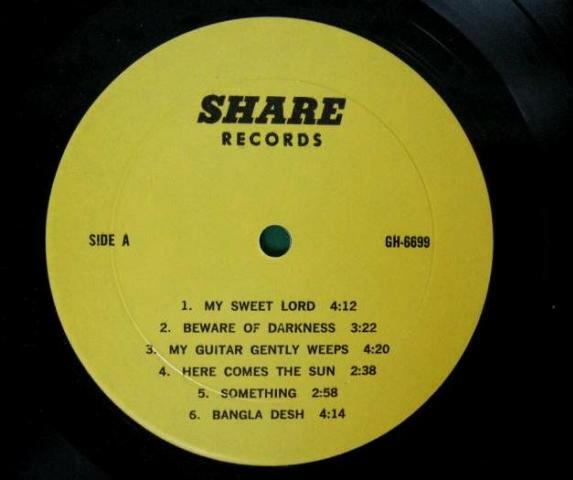 It also states that Bangla Desh (BANG Records 4022) contains the same material. 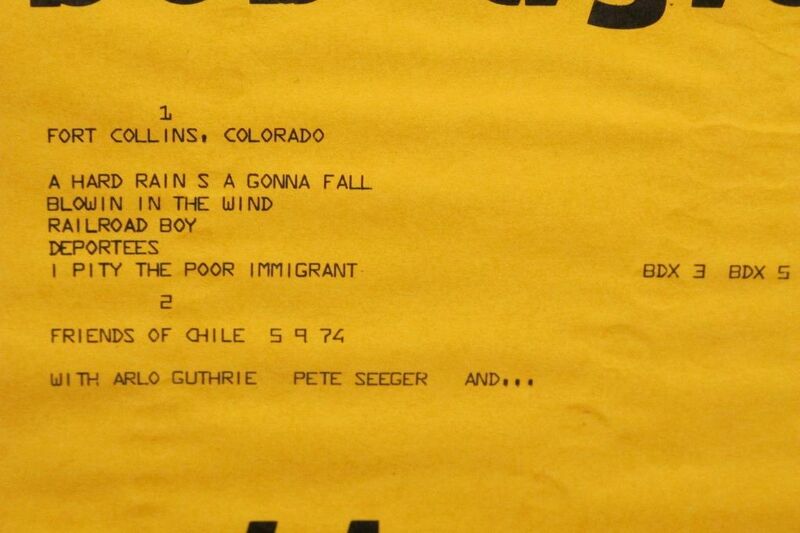 That LP is then listed in Eight Arms To Hold You as the suggested source for three tracks from the evening concert. I have since created a follow up post focusing on the WCF album. You can visit it by clicking on this text. 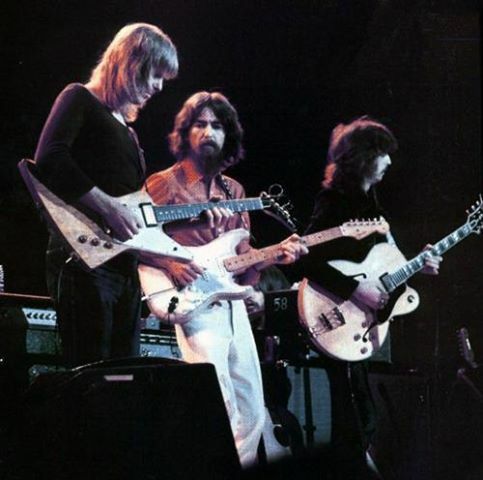 With Klaus Voormann, Jesse Ed Davies and Eric Clapton. With Don Preston and Eric – the mad axe-men of altruism.